...all fifteen thousand and 2 of them. Still working on all their names. I'm trying out the picture server. It's a bit ambiguous on the linkage. I can be more descriptive of the BBCode fragments and where the URL's are coming from if anyone wants greater detail. I finally rooted out that alder stump last weekend with the dozer and dragged the root wad off to my neighbors burn pile with the skidder. 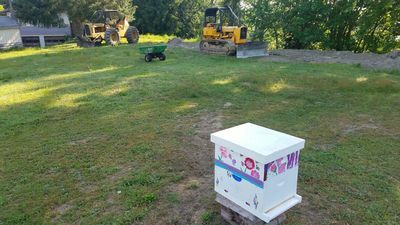 The bees arrived Friday afternoon and have been doing great. I haven't had any bees for a long time but these girls are about the mellowest I've ever seen. I'm maintaining a feeder and pollen cakes inside the super and I really don't even bother with a veil and a smoker, just pop the top and fill the jars. I've only been stung once so far when one got lost in my shirt. So embedding pictures. I don't see in the photo album a direct link to embed. So you have to get addresses of displayed pictures and there are 3 versions. Full is not really full-sized as the forum software is auto-cropping the image placement. Making it clickable to see the full-sized image. Nice. I have always just gone for 'view image' in the browser to see the-full size images. Only one more click, as it were. A 440 skidder. I haven't seen one of those in a long time. Ain't it grand when JD reuses model numbers? Like a 420 lawn tractor. Heck, even back in 1965 when they reused 820. Now there is a big difference. And, it was only a few years between the two cylinder and the three....big difference in size, tho. Reuse of 350 takes the prize, I think. Many uses of 350 out there. Sickle bar, chain saw, crawler, excavator and....the big one....articulated dump truck! That has to be the biggest difference in size for a model number.